Changing climate conditions, along with land-use and other ecological changes, are affecting the health, vitality, and resilience of Chinook salmon populations in watersheds throughout Puget Sound. Restoration and protection projects are designed to address the most critical factors affecting salmon populations. However, with climate change, these factors may change: the medium- and long-term success of the projects and expected benefits to salmon may be compromised and/or current investments may not achieve expected results. The goal of this guidance document is to provide Lead Entities with a framework for reviewing and evaluating sponsored project proposals in light of changing climate conditions. Each Lead Entity has its own process for working with project sponsors and evaluating project proposals. The guidance presented in this document is not a template for designing climate-smart projects. Rather, it provides suggested questions that can be customized to the specific needs and processes of each Lead Entity. 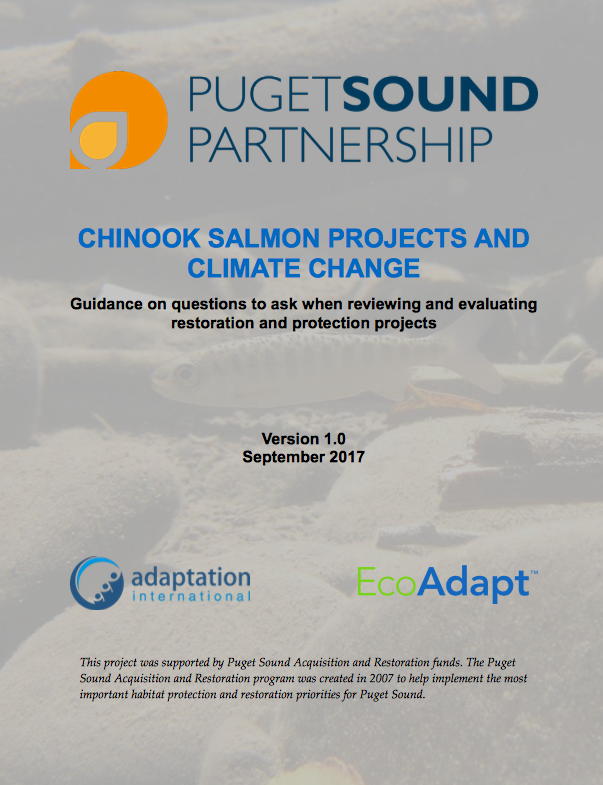 Ultimately these questions can help project sponsors develop climate-resilient projects and help Lead Entities assess whether a proposed project will be effective in supporting salmon populations and building climate resilience. The guidance in this document will be updated over time, as more information becomes available.